In this work we have investigated the effects of vitamins C and E on tumors via the mice xenotransplant model of sarcoma 180 (S180) in vivo. The experimental results suggest that dosages of 100 mg/kg vitamin C and 400 mg/kg vitamin E yields a great inhibitory behavior on tumors. Antioxidants are widely used in dietary supplements and have been investigated for the prevention of diseases such as cancer, coronary heart disease and even altitude sickness . Vitamin C is found in high concentrations in immune cells, and is consumed quickly during infections [2-3]. Vitamin C has been hypothesized to modulate the activities of phagocytes, the production of cytokines and lymphocytes, and the number of cell adhesion molecules in monocytes . On the other hand, vitamin E supplementation induces a higher differentiation of immature T cells via increased positive selection by thymic epithelial cells, which results in the improvement of decreased cellular immunity in the aged. When there is vitamin E deficiency most of the immune parameters show a downward trend, which is associated with increased infectious diseases and the incidence of tumors . Antioxidants don't always protect us from cancer. Some tumor cells can actually use antioxidants to protect themselves from natural cellular defense mechanisms, enabling them to survive and proliferate. Joan Brugge et al. were investigating changes in breast cancer cells that allow them to survive without being attached to the normal extracellular matrix. They found that treating cells with vitamin E-like antioxidants blocked the usual programmed cell death cycles, allowing the cells to survive free from their usual scaffolding by switching their metabolism to use fatty acids rather than glucose as fuel . Liu and Liu indicated that administration of vitamin E prevents thymocyte apoptosis in murine S180 tumor bearing mice . Vitamins are important for the growth of both human and animal tissues. Fodor and Kunos  reported that subcutaneous injection of vitamin C in tumor mice resulted in a great increase in the size, whereas Pollia  apparently did not observe a similar effect on the growth in vivo of a malignant dibenzanthracene tumor of the rat. In this work, we conducted a comparative study of vitamin C and E in the development of sarcoma 180 in mice. These vitamins showed significantly (P<0.00001) improved great anticancer activity for dosages on the order of 100 mg/kg (vitamin C) and 400 mg/kg (vitamin E). Transplantation of Sarcoma 180 tumor was performed following the method of Stock et al  and modified by Komiyama . S180 cells (106 cells/mouse) were implanted intraperitoneally into male albino mice. Data were analyzed by Student's t-test using the statistical program StudyResult (version 1.0 for Windows). The treatment started 48 hours after tumor implantation. Forty-eight animals were examined in this study. Mice were randomly divided into vitamin C and vitamin E-treated groups, respectively, to receive vitamin C (100; 200 mg/kg/day for 7 days in 1 ml of normal saline) administered orally and vitamin E (100; 200 mg/kg/day for 8 days in 1 ml of normal saline) by oral administration. Six days after tumor implantation, the animals were weighed, anesthetized by ether inhalation and killed by cervical dislocation, and the tumors carefully excised and weighed. The negative control group was given normal saline (0.9%) of the same volume according to body weight. Statistical methods were based on Snedecor and Cochran . The experiment was repeated three times. The results were identical for each dose. The animals were handled under the supervision of the Ethics Committee of the Centro de Ciências Biológicas (CCB) da Universidade Federal de Pernambuco, Recife, Pernambuco, Brasil. Figure 1 and Tables 1-2 show the results. 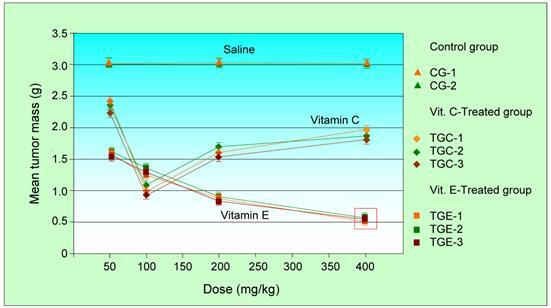 The mean tumor weight of S180 in the vitamin E-treated group was lower than that in the vitamin C-treated group. where C is the mean tumor mass of control group, T is the mean mass of treated group. From Table 1 and Figure 1. We observe that for large dosages of either vitamin C and vitamin E the mice died. For intermediate dosages the inhibitory effect of vitamin C is dosage-dependent. Most cells express two different transporter systems for vitamin C; a transporter system with absolute specificity for ascorbic acid and a second system that shows absolute specificity for dehydroascorbic acid . Ascorbic acid is transported by the SVCT family of sodium-coupled transporters, with two isoforms molecularly cloned, the transporters SVCT1 and SVCT2, which show different functional properties on different cell and tissue expression. Probably, the not linear inhibitory effect of vitamin C is caused by the saturation of SVCT2 and SVCT1 transporters inside tumor cells but only for vitamin C doses between 100 and 400 mg/kg. However all experiments with different dosages indicates that appropriate dosages of vitamin E appear to have a better inhibitory behavior for the tumors than vitamin C. Although more detailed investigation is necessary, the present results suggest that, at least for mice, 400 mg/kg vitamin E appears to be an ideal dosage for tumor inhibition. On the other hand, there is significant statistical difference between the treatment with vitamin C and vitamin E, P < 0.00001 for tumor development in animals by Student's t-test. The mean mass of the sarcoma 180 tumors as a function of the administrated dose. Significant changes are indicated by red rectangles. Vitamin E-treated group: 16 animals; vitamin C-treated group: 16 animals; Control group: 16 animals. Our results suggest that vitamin E and vitamin C (in a lower rate) has inhibitory behavior on the growth of sarcoma in mice. In particular, for dosages on the order of 400 mg/kg and 100 mg/kg we obtained stronger effects. Thus, our results suggest a combatively stronger effect of vitamin E and that dosages could play an important role in the inhibitory properties of sarcoma 180, but the mechanism remains unclear. We suggest that stronger anti-tumor effect of vitamin E in relation to vitamin C is due to different mechanisms of anti-tumor action between these molecules. Vitamin C modulates the activities of phagocytes, the production of cytokines and lymphocytes that destroys the tumor cells. On the other hand, vitamin E plays an important role in the differentiation of immature T cells in thymus. On the other hand, the dynamics of penetration of vitamins and drugs shows that a principal route of molecular penetration in cells is through lipid-rich intercellular routes [14-15], the cell penetration of water-soluble vitamin C in tumors is very low. A substance having good lipid solubility diffuses well across the cells. Thus, it has been assumed that the vitamin E permeates well since this vitamin is very lipophilic. Probably this particular property makes it more effective as antitumor agent. These results suggest that vitamin E is a potent anticancer nutrient for promoting health. We acknowledge financial support from CNPq and Faperj (Brazil).